One of the most famous archeological monuments - Old and New Nisa are in a few kilometers from Turkmenistan. The study of this ancient city was begun at the last century by archaeologists from different countries. The distance of two separated cities is one and a half kilometers. Old Nisa is translated as Konenusay and New Nisa – Tyazenusay. Unlike New Nisa, which was full-fledged city until XIX century, Old Nisa stopped its existence long ago. During the excavations of Old Nisa, were found many artifacts of ancient civilization, what cannot be said about New Nisa. 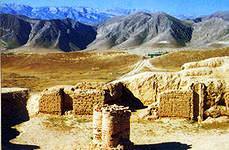 The city walls of Old Nisa built of mud brick, which was a traditional building material in Central Asia. Ancient walls of the city were destroyed because of archeological excavations and precipitation. Many people are wondered the meaning of the word “Nisa”. According to medieval geographer Samani, it is a word of Arabic origin, means "woman". There is a legend that says about Arabs who wanted to conquer Central Asia, but they changed their mind after learning that only women live in the city. Modern linguist decipher this word as "a convenient place to settle". The ancient cities Old and New Nisa are interesting and historical monuments which attract tourists from different countries. In addition, in 2007 this architectural monument was included to the list of world heritage of UNESCO.